The world première of We Margiela takes place in Museum Boijmans Van Beuningen on Sunday 22 October. 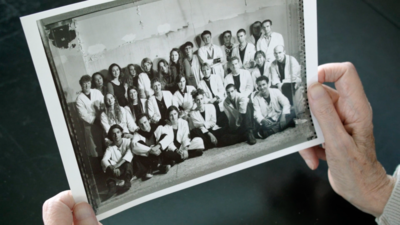 In the documentary by the Rotterdam mint film office, Jenny Meirens, the co-founder of Maison Martin Margiela, and the creative team tell the extraordinary story of the creation of Maison Martin Margiela for the first time. The choice of Museum Boijmans Van Beuningen as the venue for the film première is most fitting, as the fashion house staged its first museum exhibition there twenty years ago. The world première is also part of the programming around Change the System, the exhibition in the museum about art and design’s power to make change that opens this autumn. After Rotterdam, the film will have its international première in the ModeMuseum Antwerp and in 10 Corso Como in Milan. The Belgian fashion designer Martin Margiela started Maison Martin Margiela in 1988, with Jenny Meirens. In We Margiela, Meirens and members of the creative team openly discuss the creative processes, the approach and the fashion house’s unusual philosophy. In-depth interviews and unique archive material provide a fascinating insight into the birth and the ultimate sale of one of the most influential fashion houses of its day. The filmmakers went in search of the impact of Margiela’s work on the present-day fashion world. Unique innovations by the fashion house, such as anonymity and recycling, are still key concepts for many creative makers. The film shows that the fashion house was driven by a strong gut feeling and a delight in taking creative risks. In the end, Maison Martin Margiela was one of the first modern-day fashion houses to succumb to the pressure of financial growth. When it was sold, the founders almost immediately withdrew from public life. Employees and fans were left disillusioned. Meirens and Margiela never spoke to one another again. Co-founder Jenny Meirens died on 1 July 2017. The documentary shows how she was unseen and unknown to many, yet played a vital role in the creation of the house, its approach and style. After Meirens’s death, the international media praised her visionary and trail-blazing work. As part of Change the System, Museum Boijmans Van Beuningen is staging a number of symposiums titled Change in a Day. During these events, the focus will be on change within a particular system. The screening of We Margiela will be part of Change in a Day: Fashion. After the film, there will be a round table discussion with contemporary designers and former employees of Maison Martin Margiela. Chaired by curator Annemartine van Kesteren, they will discuss the changes that have taken place in the fashion industry over the past twenty years. The film was produced with the support of the Dutch Cultural Media Fund, the Netherlands Film Fund and the CoBo Fund. The première is staged in collaboration with mint film office, AVROTROS, LantarenVenster and Cinema Delicatessen. The world première will be followed by a screening in Antwerp on 23 October on the initiative of MoMu - ModeMuseum Provincie Antwerpen (www.momu.be). The documentary can also be seen on 26 October in 10 Corso Como in Milan. From 14 October 2017 to 14 January 2018 Museum Boijmans Van Beuningen will be presenting the power of a new generation of designers to bring about change in Change the System, which will show the impact they are having on solving large global issues. The exhibition, in eight rooms, will showcase three topical subjects, shortage of resources, conflict and common consent, based on the work of some fifty national and international designers and artists including Eric Klarenbeek, Iris van Herpen, Jólan van der Wiel, Elisa van Joolen, Boyan Slat and Christien Meindertsma. There is also a programme in Change! Labs where designers conduct experiments, continue their research on site or make new work. The world première of We Margiela is part of the programme.